Paint on glass, steel, 654.7 × 152.4 cm. This spring, the Princeton University Art Museum announces two spectacular site-specific works by the internationally acclaimed artist Shahzia Sikander. 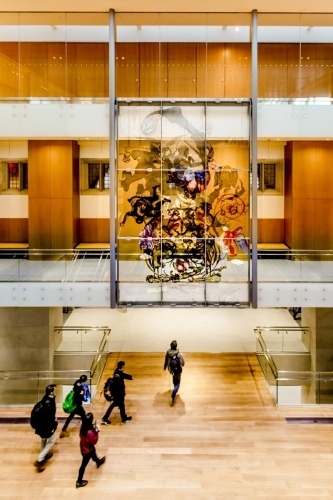 Commissioned for the Julis Romo Rabinowitz Building and the Louis A. Simpson International Building (formerly 20 Washington Road) at Princeton University, an intricately layered painting on glass and a sixty-six-foot-tall mosaic scroll are the first major public art commissions for Sikander. Trained in the traditions of Indo-Persian miniature painting at the famed National College of Arts in Lahore, Pakistan, Sikander has transformed that practice into a visual language infused with the concerns of our contemporary world. For more information, visit artmuseum.princeton.edu.